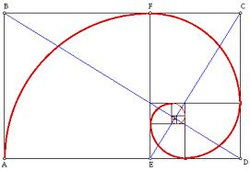 The golden ratio, also known as the divine proportion, golden mean, or golden section, is a number often encountered when taking the ratios of distances in simple geometric figures such as the pentagon, pentagram, decagon and dodecahedron. It is denoted , or sometimes . 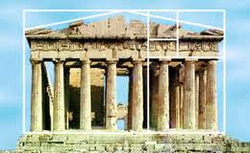 establishing a rectangle of size consonant with the work to be done, ran a string or copper wire around the points as I have described, and could thus transfer a Golden Section ratio dimension to a column, to the spacing between columns, to a metope, to a plan layout. With knowledge of the properties of the 1 : 2 rectangle, and a mechanical linear method of transfer of measurement, they were able to devote themselves to subtle elements of design. And this without having to construct a numerical interface they way we have done. Our way is easier for us, with fine calculations, CAD layout with lines of no dimension, and plotters printing out to scale. But for this we have had to provide a great deal of physical equipment, and a great deal of intellectual training and preparation for any operation we undertake.